Christmas is sneaking up really quick and I'm starting to feel the Christmas-shopping pressure! I told Aaron last week that he had until Saturday to turn in his Christmas list, but ended up agreeing to extend his deadline until Sunday. He warned me that his list would be extensive and that I could pick and choose. Thank goodness because his all-inclusive list had everything from "New Pants" to a "1999 Honda Shadow Spirit 1100" (that's a motorcycle!). Oh yeah, and let's not forget the #1 on his list--MacBook Air (??????). Anyways, Christmas shopping for Aaron should be fun and hilarious--can't wait! 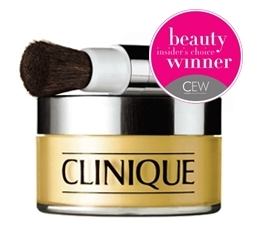 And I've read good reviews about this stuff (Clinique Mineral Powder). Anyone ever used this or have other recommendations for good face makeup?? Also, head on over to my friend Diana's adorable blog to read about my favorite Christmas tradition! And while you're there take a look at her Design blog too--soooo talented!